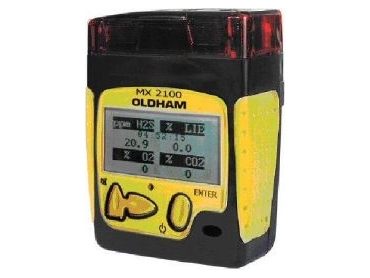 The Oldham MX 2100 5-gas portable detector. OLDHAM has more than 80 years experience in providing reliable, high-performance instruments that effectively protect personnel working in areas at risk from explosive and toxic gases or insufficient oxygen. One such instrument is the Oldham MX 2100 5-gas portable detector, now available from ProDetec . It is designed for fire and rescue teams working in factories, underground structures, sewers, refineries, oil and gas drilling platforms, ships and generally any confined environment where a risk exists. The portable multigas detector comes with an optional safe pump, auto-ranging between %LEL and % per volume. Other features of this highly reliable detector include large display, loud buzzer and warning lights.